Sausage rolls are as British as it gets. I can pretty much guarantee that you’ll find some at any party, barbecue, picnic or football match. Most Brits will buy ready-made versions from supermarkets, but I like to make my own sausage rolls – since they’re so incredibly simple to make and so damn good. Go on, give them a try, they’re the perfect finger food for entertaining. Put the pork mince into a big bowl. Peel and finely chop the onion and add to the pork mince. Add the whole egg, the breadcrumbs, parsley, nutmeg, Worcester sauce and smooth mustard to the meat, and mix with a spoon until all is well incorporated. Season with salt and pepper and mix again. Roll out the puff pastry. Cut into two long rectangles of 50x18cm, which you put in front of you so that the long side is facing you. Brush the whole-grain mustard onto the lower two-thirds of each pu pastry length, leaving a bare strip at the top. Place a roll of meat down the middle of each pastry rectangle, then brush the edge that’s not covered in whole-grain mustard with the beaten egg yolk. Fold the mustard side of the pastry over the meat and roll onto the egg-washed edge. Press down to seal. Cut each pastry roll into 12 small sausage rolls, and place onto a baking tray lined with baking paper. 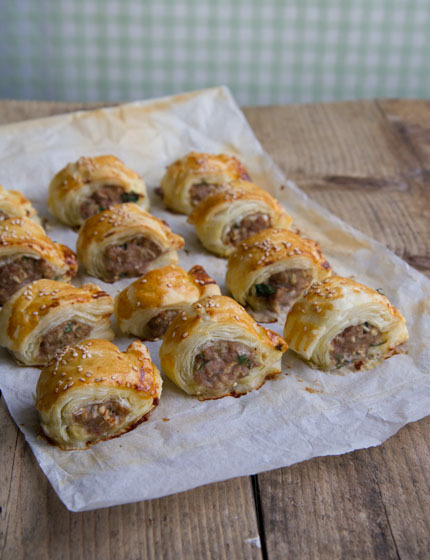 Brush each sausage roll with the beaten egg yolk and sprinkle sesame seeds on top. Bake for 25-30 minutes, until the pu pastry has risen and turned golden. Eat while still warm or let the rolls cool down and take them along to a picnic.